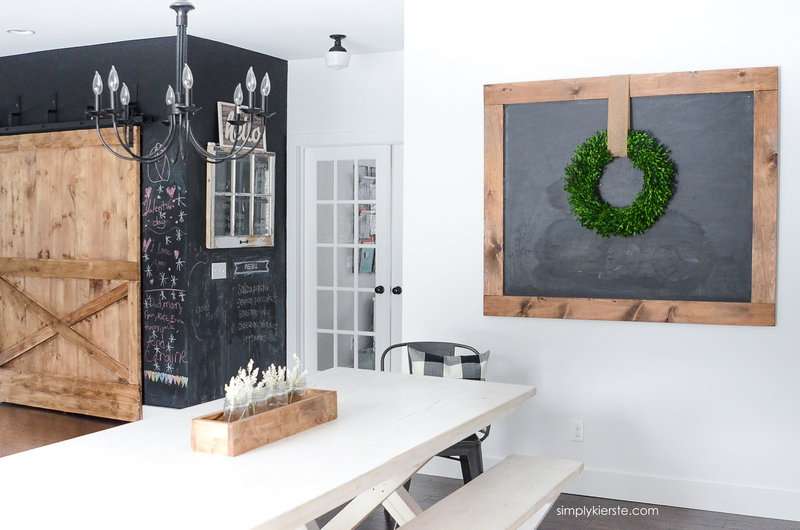 While we were building Old Salt Farm, I knew I wanted to make a giant chalkboard for a large wall in our dining room. 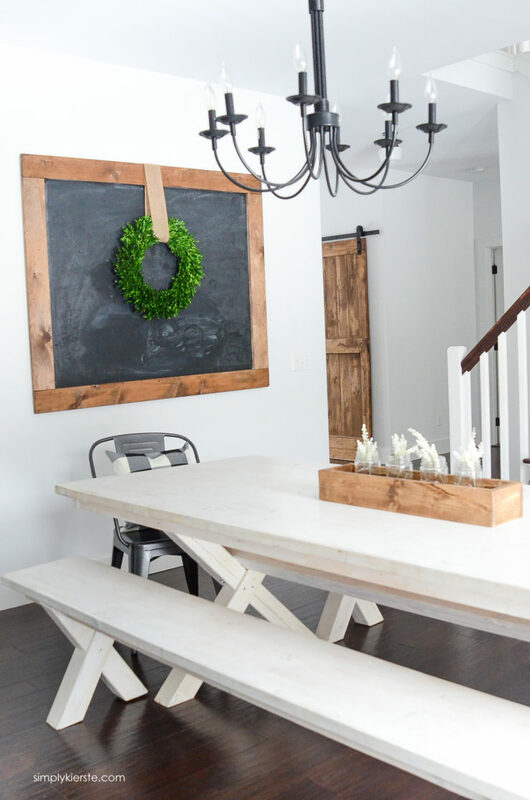 I’ve always loved them–not only because they’re super cute and the epitome of farmhouse style, but because they’re so versatile! I’ve hung several different wreaths on it, and strung twine to hang Christmas cards and paper sacks for a countdown. I’ve written messages and quotes on it, and left it plain. I love having so many options. 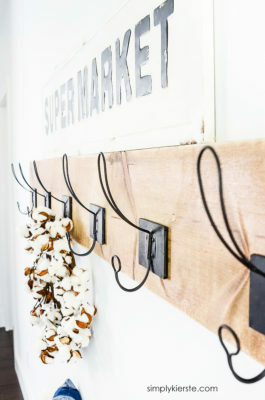 It’s also pretty inexpensive to make, considering it can cover a huge space! Ours is 4×6, and we spent less than $40 to make it. It’s seriously one of my favorite things, and I have a few more planned–one for the office, and for the playroom. If you have been thinking about making one…do it! They’re perfect for that large wall you want to fill, on a mantel, over a bed, in the office or playroom, in a long hallway–pretty much anywhere. I’m so sad I don’t have any pictures of the process for you! I made this in the week or so before we moved, and it was pure chaos. I know I took some, or at least I think I did…lol. It really is easy and straightforward, and I’ll spell everything out in the directions below. Just let me know if you have any questions! We used 1/4 inch birch plywood for a couple of reasons. First of all, it’s lightweight, and since I was going to hang it on the all, and because it was going to be quite large, I wanted to reduce the weight. Secondly, I was able to purchase it in a 4×8 sheet, which is the largest I could find at my local Home Depot. It was around $25, which for that size is a great price! The plywood was 8 feet wide, and I needed it to be 6 feet, so we cut it down to the desired size–which is 4×6. 1. I painted the board with three layers of chalkboard paint using a foam brush, letting each coat dry before adding the next. 3. Once the boards were cut, I stained them and let them dry completely. 4. We attached the boards to the chalkboard frame first with wood glue, and then with 3/4 inch nails. We used a nail gun, but you could also use a hammer! 5. The last step was to season the chalkboard to avoid any “ghosting”. That means if you write on it without preparing it, you will never be able to fully erase it–a faint image will remain there forever. Seasoning it takes just a few minutes–use the side of a piece of chalk to completely chalk over the entire board, first vertically, then horizontally. Wipe it all off with a lint-free cloth, and remove the excess dust. That’s it! 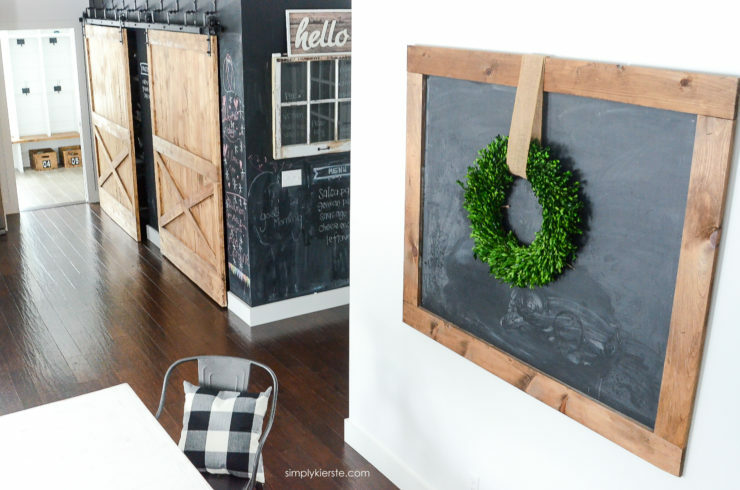 You’re ready to hang your chalkboard! You might also like some of my other farmhouse style projects! It’s perfect. I sure love seeing your new home come to life. I have a question. They also sell the chalkboard material at Lowes. Do you have any idea which works better? 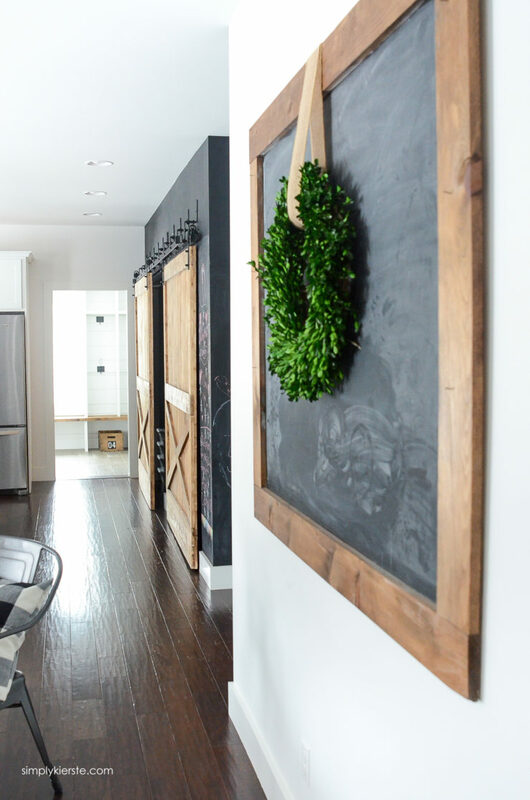 The prepared chalkboard boards or the chalkboard paint? 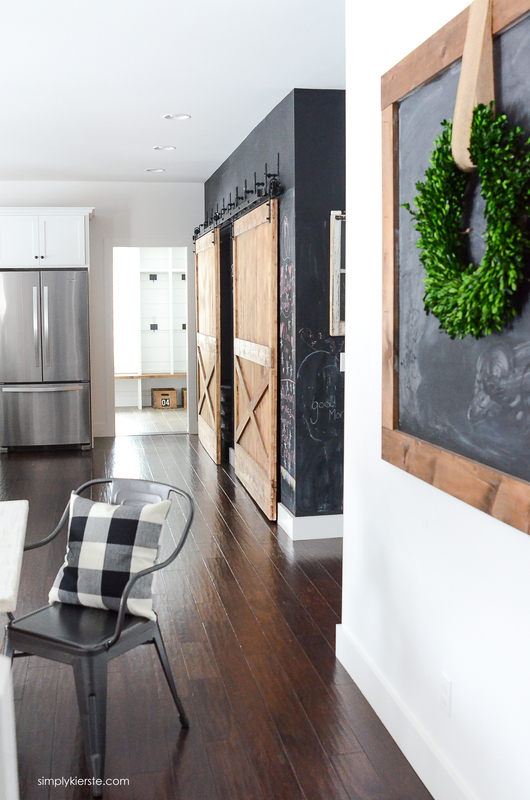 Hi Kierste- Would you mind sharing the source for your bypass barn door hardware? We need to do something similar with two big doors that slide in front of each other and are having trouble finding something that works. Thanks so much – your home is so beautiful! Hi Kierste!!! I want to thank you for always sharing your beautiful ideas with us!!! Did you nail the frame to the plywood from the back or the front side? I did not notice any nails on the front so I was wondering! Everything that you do is amazing! 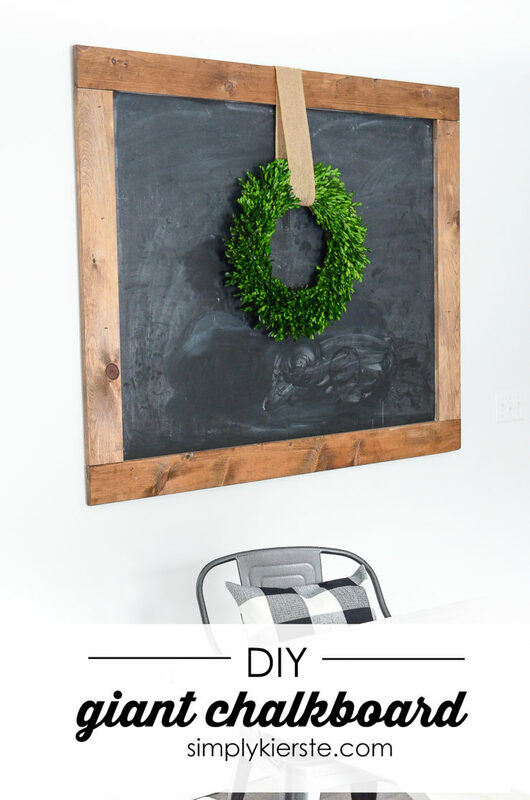 You have posted before where you purchase your boxwood wreaths and I cannot find that information. Would you mind sharing? Target and Amazon are two places I check first–also check saveoncrafts.com–they often have them for a good deal.